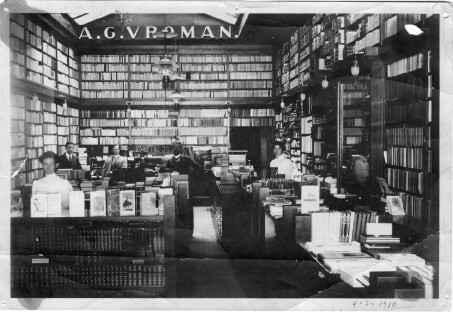 Vroman’s Bookstore was founded in 1894 by Adam Clark Vroman. Born in 1856 in La Salle, Illinois, Mr. Vroman moved to Pasadena, California in the late 1800s hoping the weather would improve his wife Esther’s health. Sadly, Esther died two years later, and the brokenhearted Mr. Vroman sold his beloved book collection to raise the capital to open a bookstore. Mr. Vroman loved books and loved giving back to his community. He helped to rescue some of the old Franciscan missions from decay, helped establish the Southwest Museum (now part of the Autry Museum), and he was a great supporter of the Pasadena Public Library. There’s even a story of him loaning money to a competitor, and helping him establish credit with vendors, so that the man could start his own bookstore. Mr. Vroman was also a passionate photographer, specializing in scenes of the American West and his portraits of Native Americans, notable for the respect he showed the people. Ansel Adams called Mr. Vroman one of his influences, and Mr. Vroman’s work hangs in both the Huntington and the Southwest Museum. When Mr. Vroman died in 1916, he left the bookstore to longtime employees, one of whom was the great grandfather of the current owner. Vroman’s Bookstore holds an important place in Southern California’s history. For many years, Vroman’s was the largest bookstore west of the Mississippi, and it continues to be the oldest and largest independent bookstore in Southern California. 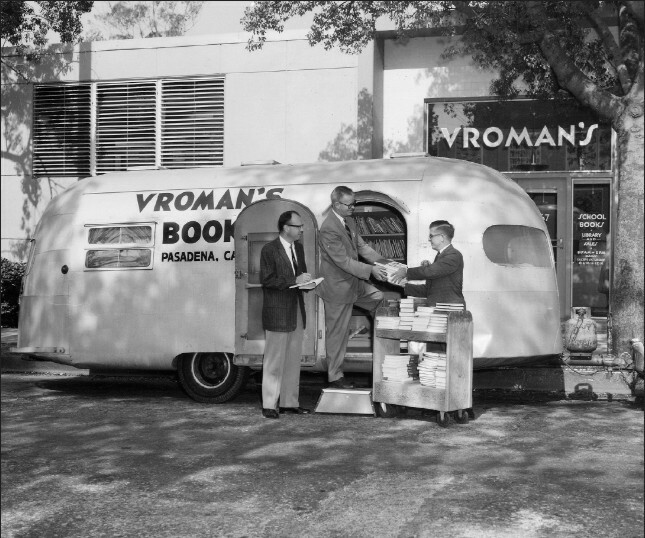 During World War II, Vroman’s donated and delivered books to Japanese Americans interned at nearby camps, returning on several occasions despite being fired upon by camp guards. Through the years, it has continued to be an independently owned family business, now consisting of two Vroman’s locations, two Vroman’s boutiques located at LAX airport, and an ecommerce site. In 2009, Vroman’s bought another beloved independent bookstore, Book Soup in West Hollywood, after its owner died and the store was in danger of closing. Mr. Vroman's legacy of philanthropy continues into the present day. Throughout the years, the store has supported a variety of causes and institutions through food drives, holiday gift drives free hiv testing, bone marrow donor match drives, pet adoption days, mentoring and support for local girl scout troops, donations for charity raffles, school book fairs, and the Vroman's Gives Back program. Vroman's Gives Back is a charitable program that donates a portion of customers’ purchases to local nonprofits, including public radio stations, arts centers, family services, and programs supporting literacy, the homeless, and animal welfare. To date, Vroman's has donated over $719,713.70 on behalf of our customers. Vroman’s is also famous for its world class author signings and events. The store hosts over 400 free community events a year including children’s storytimes, trivia nights, craft classes, bake-offs, and special launch parties, and has hosted such authors as President Bill Clinton, President Jimmy Carter, Irving Stone, Upton Sinclair, Ray Bradbury, David Sedaris, Salman Rushdie, Walter Mosely, Joan Didion, Barbara Walters, Anne Rice, Neil Gaiman, and Justice Sonia Sotomayor. In 2008, Vroman's was honored with the Publishers Weekly Bookseller of the Year award. The annual award is chosen by a panel of industry professionals, and honors the very best bookstores in the country. Criteria for the award include clarity in mission and vision, expertise in buying for its target markets, innovation, successful events, and business efficiency. Vroman's has also been recognized throughout the years for our excellent customer service, our extraordinary staff, our extensive book inventory, and our wide range of gifts, ranging from stationery, cards, and fine writing instruments to jewelry, handmade gifts, fair trade merchandise, candles, purses, scarves, and much more! Vroman’s is a Pasadena institution, a literary landmark, a community center, and a wonderful tradition. We hope you visit us soon!